UMBC’s 19th Undergraduate Research Symposium in Chemical and Biological Sciences on October 22, 2016, drew a record number of talented young researchers from across the mid-Atlantic. Of the 647 attendees, 331 were student presenters, including students from UMBC’s own STEM BUILD initiative. Two large poster sessions in the University Center Ballroom anchored the day-long event, spotlighting 274 student posters on research topics from cricket behavior to breast cancer to biodegradable polymers. Judging the posters were 74 faculty who selected award recipients in biochemical and molecular biology, biological sciences, and chemical sciences. Workshops and a plenary speaker provided additional opportunities for attendees to expand their horizons. Susan Hindle, assistant director of internships and employment in UMBC’s Career Center, led a “Master the Art of Making Connections” workshop. “Academic achievements alone are not enough to be successful in today’s workplace,” she shared. Hindle discussed how to make a good first impression and be an active listener, and she taught attendees the elements of a strong “30-second commercial” about their experience, interests, and goals. She also gave tips for networking at an event like a research conference. Jim Thomas, philosophy lecturer at UMBC, discusses science ethics with students during a workshop. 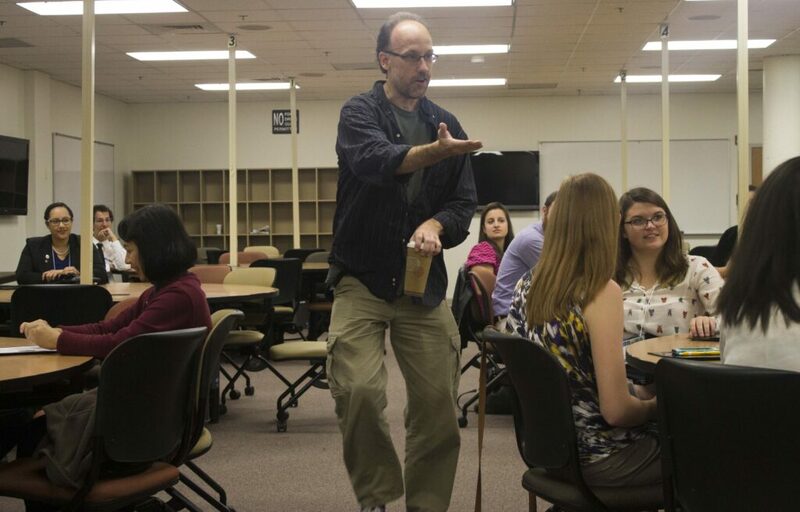 Jim Thomas, UMBC philosophy lecturer, offered “A Very, Very Short Introduction to Ethics for Scientists.” The workshop encouraged students to examine why they make the ethical decisions they do. “Even if a person disagrees with you, reasons can be understood, maybe even changed or amended, and that creates better understanding, and so a better community, all around,” said Thomas. Plenary speaker Colleen Burge, assistant professor of marine biotechnology at UMBC, used her talk to offer advice for student researchers in the audience, through the lens of her own work on host-pathogen interactions in marine environments. Banner image: The University Center Ballroom during the Undergraduate Research Symposium. Photos by Mohammed Arafat ’20, biological sciences.